Congrats to Jeni Pim who won the Fenn's Quay Chef du Jour 2012 in a cook off with Sarah O'Riordan over four courses last night. Jeni is pictured above receiving her prize from Michael Creedon of Bradley's (the sponsors). Photos, clockwise from top left: Antipasti of Bruschetta with Bloody Mary Shot (by J), the two starters, on a judge's plate, (Baby Beetroot and Shallot Tatin (J), Crispy Duck Egg with Asparagus soldiers (S), Tiramisu Cake (J), Lamb Neck Fillet (S), Beef and Beetroot Slider (S) and Churros with mocha ganache and chocolate mousse (S). So well done to the earlier contestants, Paul Callaghan and Paul Axford, to Kate Lawlor and her team at Fenns Quay and thanks also to my fellow judges Margaret Smith and Evin O'Keeffe. On Tuesday next, May 1st, at 7.00pm, renowned Chef Rory O'Connell, will lead a cookery demonstration of English Market produce at the Department of Tourism and Hospitality, Cork Institute of Technology. The Market traders are hoping that the initative will "marry practice with the theory" and the organisers are also hoping that funds will be raised for Cork Penny Dinners. Tickets cost twenty euro and are available from ABC and Iago in the market. 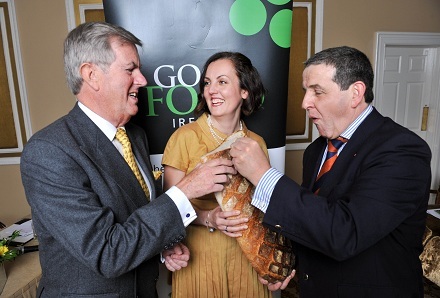 Redmond O'Donoghue, Santina Doherty and Peter Malone get to grips with an Arbutus loaf. 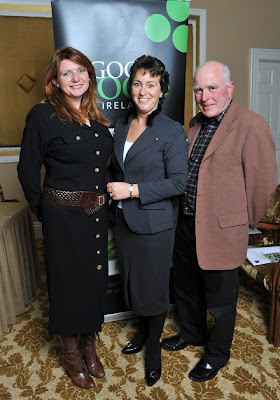 Last Wednesday, Chairman Redmond O’Donoghue welcomed the audience as The Good Food Ireland “roadshow” touched down in the Hayfield Manor in a middle of seven consecutive information sessions for its members countrywide. You may see the agenda here. Ciara Jackson heads up the Food and Beverage team at Grant Thornton and presented their recent report on the massive contribution that GFI and its approved providers are making to the Irish economy and how that role may be grown. Each visitor had a copy of the report and you can read more details of the report here. Amazingly, the report team found that almost 70% of GFI producers were unaware of Research and Development tax credits which “give an overall potential tax benefit of 37.5%” of the expense incurred. Worth checking out! 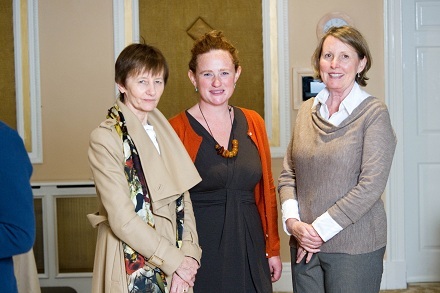 Margaret Jeffares, Founder & Managing Director of Good Food Ireland, then took the mike and gave a special welcome to two friends of Ireland from the US who were in the audience: Rachel Gaffney and Ginger Aarons. “Five years on and we have a great group of businesses behind the GFI brand. But this is only the beginning,” summed up her optimistic speech, reinforcing what the chairman had earlier outlined about Food Tourism. The initial website has helped Good Food Ireland establish itself in the past five years but now it is time to change. And Santina Doherty revealed exciting plans for the second generation website which should be online by early Autumn. I have seen Peter Malone of Nenagh’s Country Choice, who has been with GFI since the beginning, speak on a few occasions and just love the way he gets down to basics: buckets of blood at Jack McCarthy’s in Kanturk, spuds at the Hayfield. He also spoke passionately about another basic: integrity. “The producer is our friend. Don’t screw him or her!” There must be an honest relationship between the restaurants/hotels and their producers and between them and their customers. Respect, honesty and fairness were his key words. The more we pull together, the further we will go. A question and answer session then followed and before the conference broke up, members were busily making contact with one another, as if already taking the founder’s words to heart. 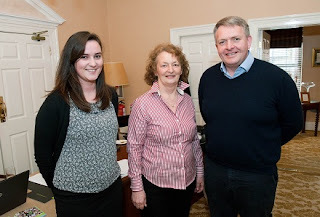 Rachel Gaffney, who brings a planeload of Escoffiers here next April, was surrounded as she had indicated the gourmet tour would be in the Cork area and so quite a few of the local providers, mainly restaurateurs, took the opportunity to put their names down. Networking at work! If you want an assured continental touch when eating out in Cork, then head for Star Anise in Bridge Street, celebrating ten years in the business this year. Dropped in there during a showery Friday lunchtime and spent a couple of bright hours with Virginie and company. Started off with a Tomato soup, though not Tomato and Basil as you might expect but Tomato and Fennell. Enjoyed a really big bowl for just €5.50, big on value but big too in quality. We differed on the main course, though we both choose from the specials. CL went for Lamb Kofta while I choose the pan-fried Sea Bass. 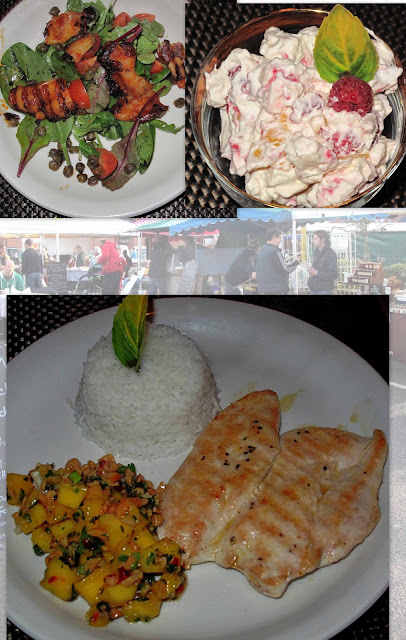 Two excellent dishes, the meat for 12.50, the fish 15.00. The meatballs were served with fried potato, a rocket salad, aubergine puree and a cool mix of yoghurt, cucumber and mint. A superbly cooked tasty combination. And so was the Bass, which was accompanied by fried potato, peas (petit pois), pearl onions, lardons and a Salsa Verde. Lots of little flavours, some contrasting, yet all combining so well to give a very satisfactory balance indeed. The dessert was also that little bit different: Caramelized banana and Pecan Cheesecake with butterscotch sauce (6.25). It was just as well we decided to share this as we were pretty full after the two courses! Finished off with a couple of Americanos at 2.20 each. And, almost forget, we sipped a glass of wine each. I had the excellent 2010 Chenin Blanc by A. A. Badenhorst (South Africa) while CL, a fan of the Spanish grape, thoroughly enjoyed her 2009 Tempranillo by Candidato (Castilla). Speaking of wine, part of the anniversary celebrations will consist of a wine dinner with legendary Lebanese wine-maker Sami Ghosn (Massaya) on May 16th. More details here. It's true! It's true. Nash 19 are back in business on Saturdays. And the city centre favourite has come up with very enticing menus indeed, menus that could keep the dedicated Saturday eater (and his or her child) going for months. Take the Breakfast menu (9 to 12). How about the Big Corker and the Little Corker? The Lordan sausage, new to Nash customers, features here as does old favourite Jack McCarthy's Black Pudding. But there is so much more, so many tantalising choices: Creamy Porridge, Blooming Benedict, and Magic Mushrooms. Too late for breakfast? Not to worry. The Brunch Menu (12 to 4) is fabulous. And so flexible, as you can add your favourite bites and pieces. With the Caesar Salad for example. That Ploughman’s Platter would keep a shopper going for the rest of the day or revive an early morning shopper on his or her last legs! Crab, Tuna, Goat's Cheese and loads of their tasty signature sandwiches. Could be hard to get out of here on a Saturday! Let me introduce you to a grand couple, from the area of Cariñena, situated about halfway between Madrid and Barcelona. One is red and the other is white and neither costs the earth yet these entry level wines are well worth getting to know. Colour is a beetroot red. Nose of candle wax. Not really! But there was a candle burning right alongside. There are notes of red fruit, such as strawberry. There is beautiful red fruit on the palate and it is quite smooth, really well balanced and so much better than you’d expect for €9.99. Intense, young, fresh and fruity, the label promises and the bottle delivers! This white also delivers, big time. Light honey is the colour while the nose is fruity, mainly apple. On the palate, it is fresh and fruity, a refreshing mouthful with a decent finish. This has the second glass factor. Maybe the second bottle factor. Affordable and worthwhile. Macebeo is often described as the Spanish workhorse grape and is also known as Viura and as Macabeu and Maccabéo in Roussillon.To describe this historic grape as a work horse is a bit harsh, particularly in the light of the excellent wine in this bottle. The installations, built to look like a monastery (hence the title of this group of wines), of the producers Grandes Vinos y Viñedos are located in the municipality of Cariñena, the most important town in the Campo de Cariñena area of Aragón. The Celtic Cook Off in West Cork continues to build on the success of the inaugural event in September 2011 by attracting top chefs from the Celtic regions to take part in what is becoming one of the landmark culinary events of the year. The 2011 Celtic Cook Off was held as part of the A Taste of West Cork Festival that proved very popular with the paying public, the local food producers, Fáilte Ireland, the media and all the Chefs involved. The basis of the Celtic Cook Off was to create a fun and informative Cooking Show that showcases the best of West Cork produce cooked simply with each Chef’s own interpretation and ideas. Stephane Delourme has worked at The Seafood Restaurant in Padstow for over a decade. 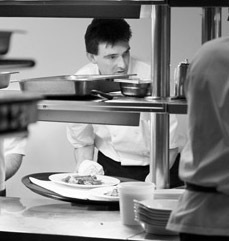 He joined Rick and Jill Stein as head chef at their flagship establishment when he moved to Cornwall in 1998. Born in Paris, Stephane spent his early years learning to cook traditional French dishes by his mother’s side in Brittany, near Quiberon where all his family come from, before embarking upon a career in the culinary arts. He resided in Paris working for Sully D’Auteuil, one of the city’s finest establishments with two Michelin Stars, before moving on to Au Vieux Berlin, specialising in game. Stephane’s talent and ability led him to England in 1983, where he worked in London’s Roof Restaurant at the Hilton on Park Lane. Stephane was also instrumental in the opening of some of London’s most distinguished restaurants, working alongside leading chefs including Michael Croft at Mirabelle and Martin Webb at Quaglino’s. In 1995, Stephane returned to France where he worked at Michelin-starred restaurant Prunier in Paris for two years. His career has taken him around the globe on the world’s most famous cruise liner, the QE2, as well as to Dublin where he worked with Patrick Guilbaud his self-named two Michelin-star restaurant, before returning to the UK once more. It was in the late nineties that Stephane finally fulfilled his childhood dream to live near the coast and work with high quality seafood. He moved to Cornwall in 1998 and joined The Seafood Restaurant as head chef, which has since won ‘Best Seafood Restaurant Award’ on five occasions. Other chefs taking part in the Celtic Cook Off 2012 and its related activities during the Taste of West Cork Food Festival include Shaun Hill (Wales), Jack Stein (Cornwall), Paul Flynn (Ireland), Roy Brett the 2011 Celtic Cook Off Winner and Tim Anderson, 2011 MasterChef Winner. Location/Venue: The West Cork Hotel, Skibbereen, Co. Cork, Ireland. The Wine Institute of California are returning for their Annual Cork Wine Tasting. The trade tasting will be held on Monday 30th April from 1.30pm to 5pm at the stunning Jacobs on the Mall Restaurant, South Mall, Cork City. Followed by a consumer event from 6pm - 7.30pm at Jacobs, in conjunction with Easy Food Magazine. Most of the big Names in California Wines will be present on the day including: Beringer, Chateau Montelena, E & J Gallo Winery, Hahn Estate, Robert Mondavi, Rutherford Ranch, Stags Leap and Sutter Home. Monday 30th April - Jacobs on the Mall. This was an easy one, almost cheating. The starter and dessert were more or less readymade while the main course came from the recently published Gimme the Recipe, an excellent book by Sheila Kiely. 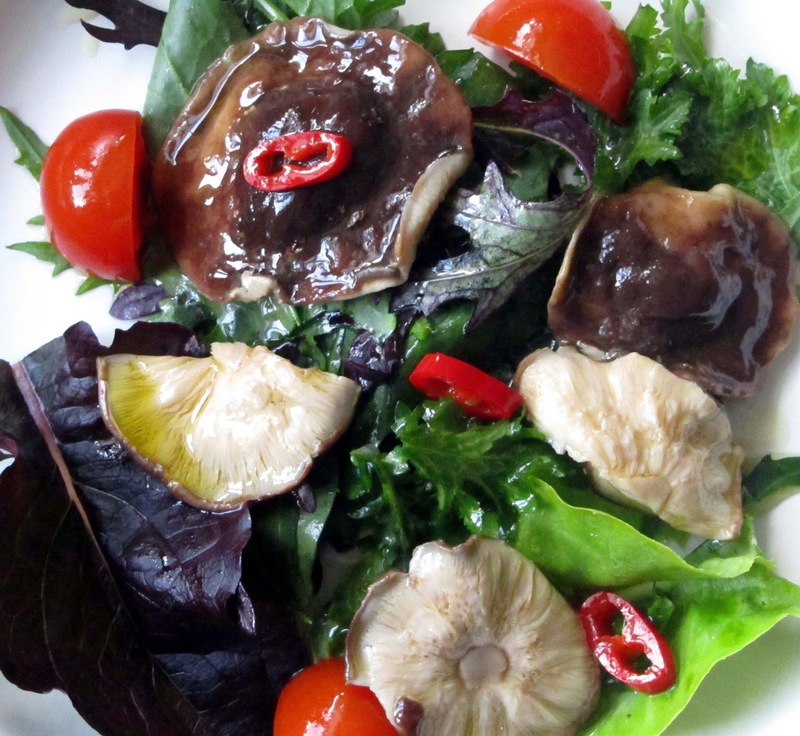 Starter: Marinated Shiitake mushrooms (by Ballyhoura Mountain Mushrooms at Mahon Point Farmers Market) with salad. 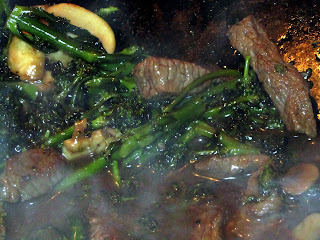 Main Course: Stir-fry of Steak (O’Mahony Butcher, English Market), mushrooms and Purple Sprouting Broccoli. The broccoli came from the Ballintubber farmer stand at Mahon and was top class, really great value as were the salad leaves used in the starter. Dessert: Chocolate and Raspberry pot, bought from Glenilen stall at Mahon. If you haven’t tried the marinated oyster mushrooms from Ballyhoura, you should. This is one of the best new products on the scene in recent months and is now matched by their marinated Shiitake mushrooms (photo). Can be served very simply, with market salad and toasted Arbutus sourdough, as we did. I’m sure chefs around the country are thinking up some gorgeous dishes, to make the best of these beauties. Beef and Mushroom stir-fry is the title that Sheila gives her dish, in which broccoli also plays a major role. We used Purple Sprouting Broccoli rather than the regular and it worked out very well indeed. Got the steaks from Eoin O’Mahony and they were top notch. The little additions (honey from Waterfall Farms shop, ginger, sesame oil, soy sauce) all added to the flavour, familiar textures yet different on the taste buds. Well done Sheila for that tasty combination. Again. Gimme the Recipe is proving to be a very useful book around this house, even if we don’t have to cater to a big gang anymore. But a little division cuts the meals down to size and we are gradually working our way through the book. 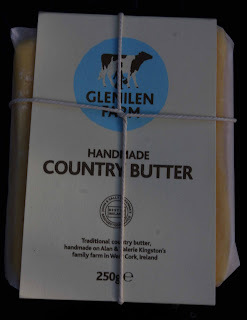 Also gradually working our way through that irresistible Glenilen cabinet at Mahon Market: yoghurts, butter, milk, and no shortage of dessert ideas. 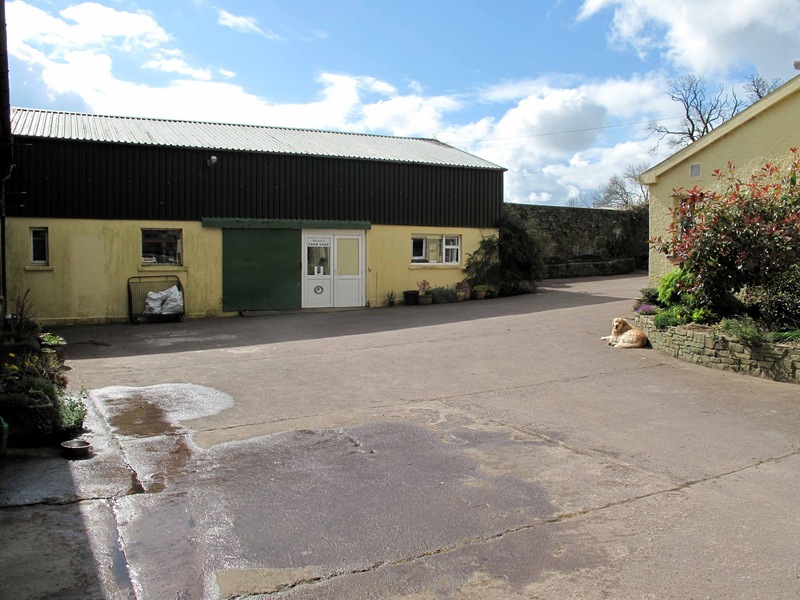 The cheesecakes and panna cottas are brilliant but we went for the Chocolate Pot on this occasion and they went down well, as does everything from this innovative West Cork farm. Wine Match: since the steak had an oriental sauce, lighter than usual, I chanced the Monasterio de los Vinos 2011 Garnacha and Tempranillo blend. The label says it is intense, young, fresh and fruity. All that and more – it was a good match - and available at just €9.99 from stockists nationwide. 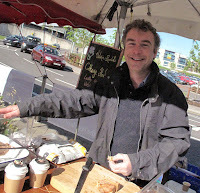 The King Oyster, Eryngii, made his debut at the Mahon Point Farmers Market on Thursday. 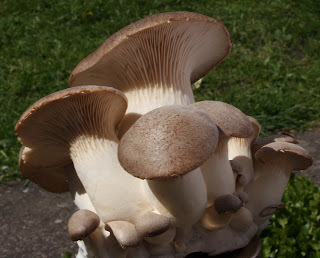 “The crème de la crème of oyster mushrooms,” enthused Lucy, one of partners of market newcomers Ballyhoura Mountain Mushrooms. Lucy and Mark have been making waves over the past few months, starting off with their range of mushrooms, including oysters and shiitakes. Gradually they have added to their products. 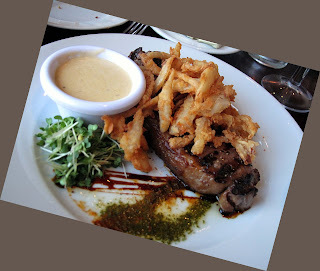 They make a terrific mushroom soup and recently unveiled the sensational Marinated Oysters. That has now been re-packaged and has been joined in the stall by the Marinated Shiitake. Both are winners and chefs have been ordering them up. No doubt the King Oyster will also be popular. Seems to be the season for wine events. There is an Alsace Wine Dinner scheduled on May 16th for L’Ecrivain Restaurant, in conjunction with Tindal Wines. The evening of fine wines and culinary delights will be hosted by Severine Beydon-Schlumberger and will consist of a 7 course Tasting menu, expertly constructed by renowned chef Derry Clarke, and combined with the highly acclaimed wines of Domaine Schlumberger. The price for this wonderful evening is €100 per person (exclusive of service charge @12.5%). As places will be limited it is recommended to reserve A.S.A.P. (01) 6611919. 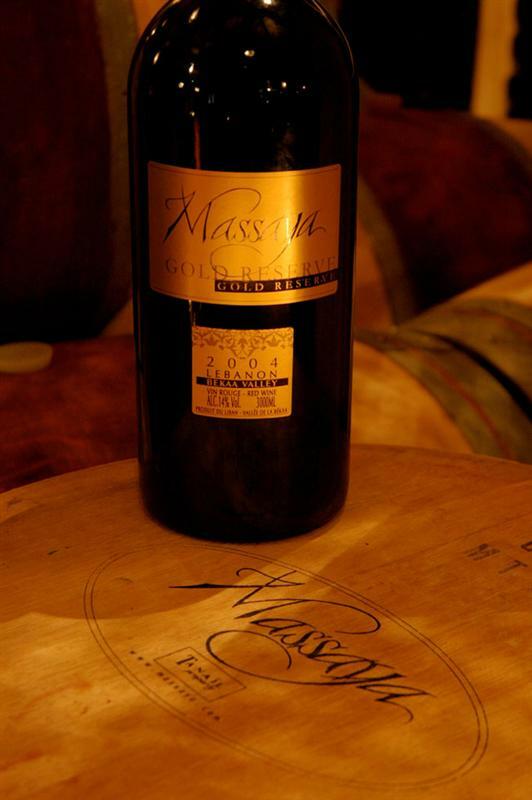 Also on the 16th, as part of the 10th anniversary celebrations for Star Anise, Sami Ghosn of the famous Lebanese winery Massaya will host a wine dinner. More details here. On the following evening, the 17th, Ballymaloe will host the Riesling Revolution. Three of the top Riesling producers will be together on stage at the Grain Store. The protagonists are Tim Adams, Clare Valley, South Australia, Carl Ehrhard, Rheingau, Germany and, fresh from her Dublin date, Séverine Schlumberger, Domaine Schlumberger, Alsace, France and the event will be moderated by John Wilson, wine writer, The Irish Times. More details here. On May 16th O’Brien’s Chop House in Lismore are hosting a wine dinner with Domaine de la Sarabande and Simon Tyrrell of the Wine Store. You can call O’Brien’s on 058 53810 for more or have a look at their website here. Before all that, California Wine returns to Jacobs on the Mall in Cork next Monday, the 30th. A trade show in the afternoon will be followed by public session, in association with Food and Wine Magazine, between 6.00 and 7.30pm. Don’t forget the cook-off for the Chef du Jour title takes place in Fenn’s Quay next Sunday evening. Check if they’ve a place left for you at 4279527. Did you ever try Una Poynton’s Pickled Cucumber at the Mahon Point Farmers Market? It is a little sweeter than most of the others. Besides, she cuts it a little thicker meaning you can a real tasty crunch when you include it in salads and so on. Worth a try. Truly Irish Country Foods, the farmer owned company that specialise in rashers and sausages, have brought out a new “funny” short video. 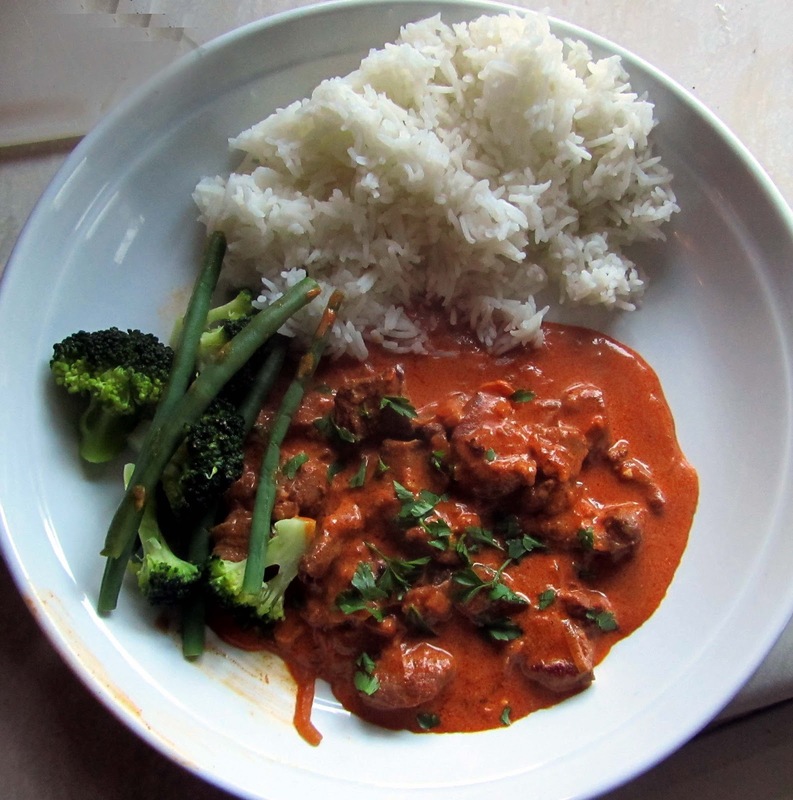 Tempting looking recipe here for Beef and Broccoli Sheila Kiely also has a similar recipe in her new book called Gimme the Recipe. 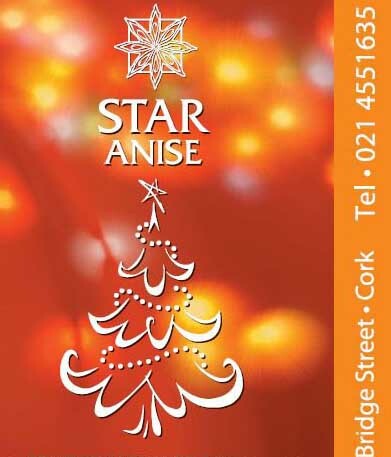 Time to say Happy Birthday or Joyeux anniversaire to Star Anise, one of the better restaurants in the city. Next month, Virginie and Conor celebrate the 10th anniversary of the Bridge Street venue and will do so in some style. And so can you. The format for the night will be a 5 course dinner with matching wines and a sparkling wine reception for €65. The little café at the back of the shop in Ballymaloe may not be the best known spot in the place but it sure is one of the busiest. 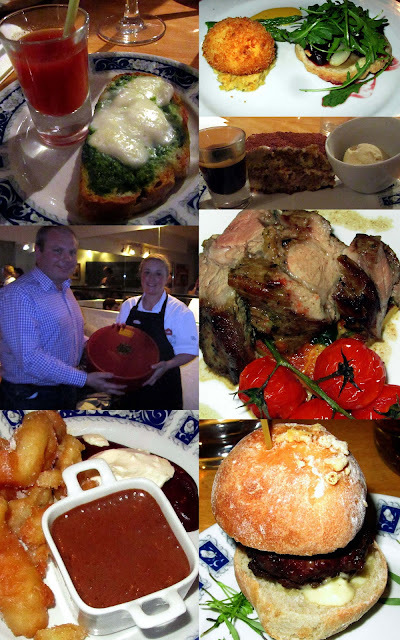 And like every other part of Ballymaloe the meals produced here are top notch, as I found out during Friday's visit. The main reason for travelling to the East Cork venue was to check out the shop for some items for the kitchen. The shop’s kitchen area has an extensive stock, everything from knives to cake tins, and there is also a textile and books area. We got our bits and pieces and then lingered a while longer, adding to the purchases, in the food area which packs quite a lot, including Green Saffron spices and Badger and Dodo coffees, into a relatively small area. You may also shop online. The time for lunch was at hand and we got a table in the café. It fills up pretty quickly so don't rely on getting a place. Still, if you can wait (check out that shop, maybe), lunch is served from twelve thirty to four. The short menu is displayed on a blackboard and we both started with the Celeriac Soup (5.20) served with a small scattering of toasted hazelnuts and flat parsley. 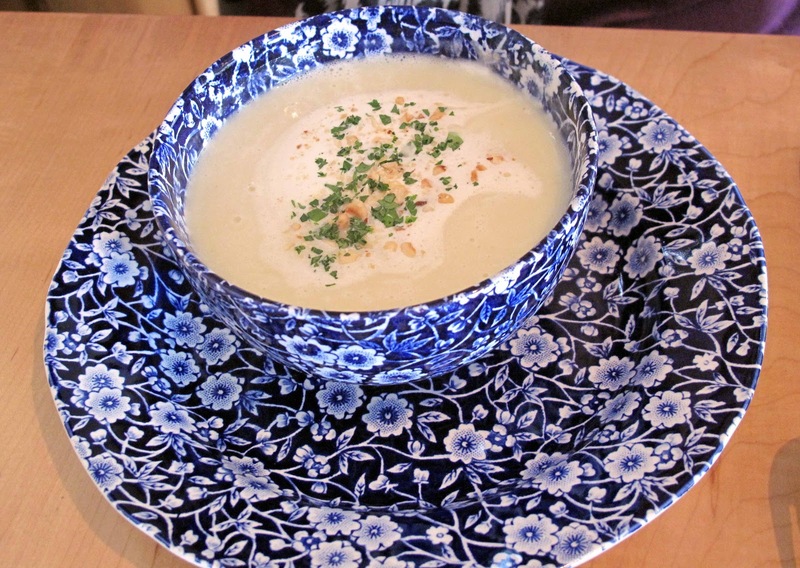 The nuts really added to the enjoyable soup, served in the distinctive blue and white Burleigh pottery (also on sale in the shop). 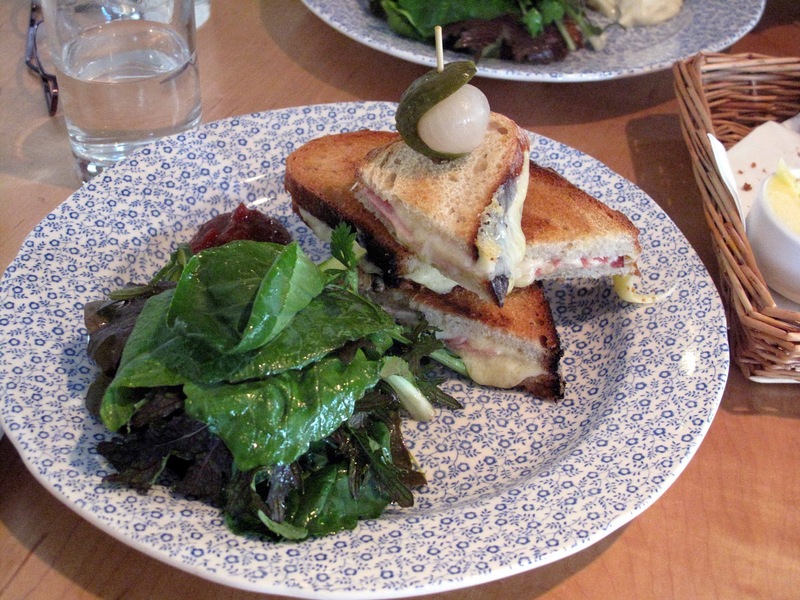 Main course for me was the Hot Sandwich of Black Forest Ham and Comté Cheese on toasted Arbutus Bread with salad and pickles (9.90). CL picked the Hederman Smoked Mackerel, with salad and homemade mayonnaise and served on brown bread (9.50). Both were well presented and each was terrific. I totally enjoyed my combination of flavours and textures as did CL. Must say that the salads in particular were just fantastic, great mix and dressing. 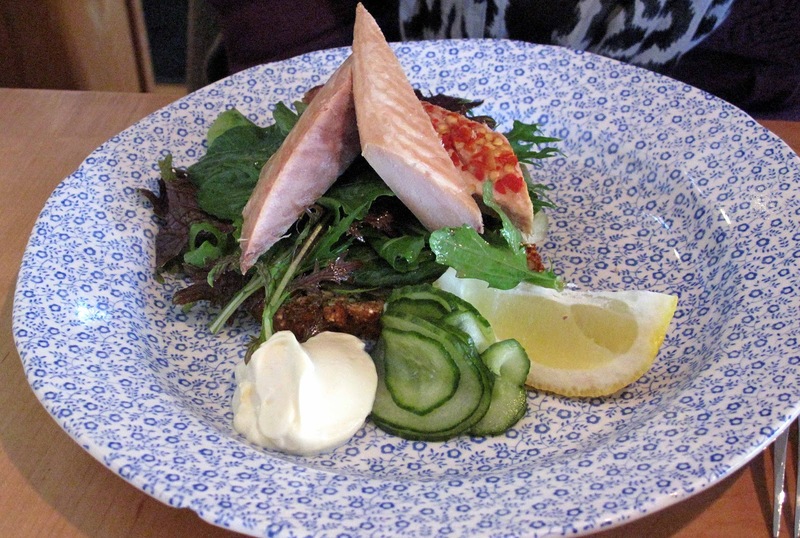 Would love to see the Café take on Glucksman’s Fresco Bistro in a Niçoise salad competition! A couple of coffees later and two happy customers, service was friendly and efficient, walked out as others eagerly walked in. It is that kind of café. * Now you can sample the café on Fridays (from 7.00pm). There'll be casual eats to share: small platters, nibbles, wine, cava, sherry. No reservation needed. Keep an eye on their Facebook page. You may take this Little Beauty anywhere..
You may take this Little Beauty anywhere, but she's a star in Asia. Little Beauty, Pinot Gris 2010 (Limited Edition), Marlborough (New Zealand), 14% abv, €19-21 various stockists countrywide. You may take this Little Beauty anywhere but she shines in Asia as I found out more by accident than design. Colour is just about present in the tasting sample in the glass, just pale hints of gold, grey and green. Nose is tempting; aromatic and musky notes draw you in. On the palate it is fruity and dry with an excellent finish. Orange zest and apricots, some would say, according to her cheeky label. She is a little forward but I wouldn’t disagree. It is full, almost creamy, a really delightful example of the grape’s potential and, as I found out, excellent with Asian Cuisine. Have you been following Rachel Allen’s Easy Meals on RTE TV? I have and last weekend matched Little Beauty with her Thai style Pan-fried Chicken with Mango Salsa and also with her Grilled Squid starter. Little Beauty handled both without a bother. QED. Pleased to meet you. Tempranillo, under another name! Tempranillo, under yet another name! MuseumReal Reserva 2004 (Cigales, Spain), 14%, €20.55, Karwig Wines. The historic Cigales area has been producing wines for centuries and this, with its distinctive pewter label, is one of the good ones! Grape variety is listed as Tinta del Pais, another name for Tempranillo, and the fruit comes from some of the oldest vines in the region (between 60 and 100 years old). Colour is dark cherry, almost black, and the nose has that cherry, also plum, also hints of oak and spice, even herbs. The fruits and flavours are expertly combined to give a smooth sophisticated wine, concentrated, with moderate tannins and fine acidity leading to a long dry finish. A great match for red meat in general and for lamb in particular. 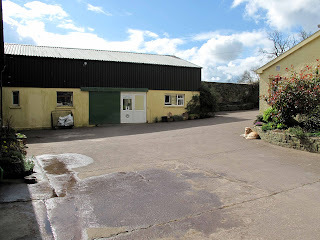 With so many farmers coming to town to man their market stalls, I did the trip in reverse last week and visited a farm shop, the one at Waterfall Farms which is situated in Ballyshoneen, Waterfall. Sounds deep in the country, yet it’s just 15 minutes or so from the city centre, very convenient to Bishopstown and Ballincollig. And you won’t get lost if you follow this map and directions! It is a pleasant trip through the country roads and there is a warm welcome, especially from the woman of the house who, by the way, bakes a smashing health loaf. That welcome continues, even though nowadays much of the business is done direct with shops and restaurants such as Nash 19. 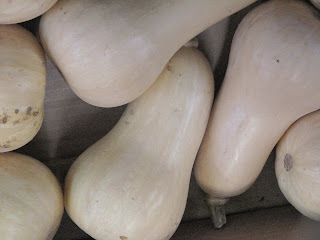 Having met the friendly dogs in the yard, we headed into the shop and the great selection of vegetables: parsnips, turnips, carrots (including yellow ones), broccoli, kale, onions and so much more. But not just vegetables. Hen and duck eggs and great to see the top notch juices from Cahir’s Apple Farm on sale here. And before you go, don't forget to take a look at the selection of second-hand books there. All the proceeds go to charity. In June, West Cork Food have a fantastic Food Break lined up for you or for your friends and relations who might be coming for a holiday. You will meet some of the area’s top producers, see how they operate and sample the top class products. You’ll find all the details here. Elke of Bia Sásta is a busy lady and she has a great gardening evening lined up for 25th April. “Kitty Scully of RTE's 'How to create a Garden' will be joining us for an evening on Kitchen Gardening. Everything you always wanted to know. This is your event. We will learn all about seeds, how to care for them, store them and plant them. What vegetables to plant when and how to 'feed' them. Eight Degrees Brewing have just launched their Czech style Barefoot Bohemian Pilsner. Scott tells me it has a subtle biscuit malt base balanced by a generous lashing of Czech hops giving a nice spicy hop aroma. ”We stored it for 2 months in our conditioning tanks to give a nice crisp finish. Like always: no chemicals, additives and preservatives.” If you the Czech lagers, such as Staropramen and 1795, you’ll like this. I picked up a few bottles from Bradley’s at the weekend and enjoyed them very much indeed! The Côtes de Provence, how I loved my wine trips down there last summer, comes to The Twelve, Bearna, Galway. Check it out here. Very disappointing to find that an English Market stall put their price label across the use by date label on a packet of rocket that cost 2.99. I bought it on the 13th and the expiry date was the 11th. Opened it on the 14th and the rocket, as you’d expect, wasn’t exactly at its best. It stank. It was then that I peeled off the top label and saw the expiry date. Not nice. Springtime lettuces and greens like rocket, spinach and watercress are at their best – time to enjoy fresh tossed salads for a lovely light lunch or dinner! Easy meal, thanks to Rachel. By the way, the leaf on the rice is not Lemon Balm (variegated) but Ginger Mint. This edition of Market Meal owes much to Rachel Allen as all three dishes are based on her RTE series Easy Meals. The starter and mains were on last week's programme. The starter is a spicy squid salad and we got most of the ingredients in the English Market, the squid from O'Connell's Fish. Had a bit of a problem with the rocket though as the stall, deliberately or otherwise, had put their price label across the use by date label. I bought it on the 13th and the expiry date was the 11th. Opened it on the 14th and the rocket, as you’d expect, wasn’t exactly at its best. It was then we peeled back the top label. Rushed up to the local Supervalu and got a mixed bag of leaves (including rocket) in tip top condition. No problem with the ingredients for the Pan Fried Chicken and Mango Salsa main course. The chicken breasts, which were absolutely superb, came from O'Sullivan's Poultry stall, in the English Market. Must say that all the dishes were easy to cook and all were superb, light and tasty yet filling enough. With some Mango on hand, we decided to skip last week's suggested Chocolate Dessert and instead choose an earlier Mango and Raspberry Mess by Rachel. Once again, it was a cinch to assemble. And easier still to eat. Just three letters needed to describe this: Yum. Had to make up my own mind on the wine and struck the jackpot with Little Beauty's Pinot Gris, Limited Edition 2010, from Marlborough, New Zealand. They recommend it on their notes for Asian Cuisine and it turned out to be just perfect. Distributed here by Wine Alliance and available at stockists nationwide. May be it was the spring sunshine. Maybe it was the band. Maybe it was the street entertainer guy who used plasticine to cover his face with a Devil Mask. 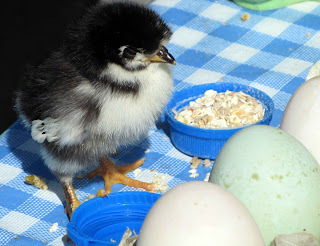 Maybe it was the chirpy Easter chick. Can’t quite put my finger on it but, for the first time in a while, I left the Saturday Coal Quay Market with a good feeling, some unexpected purchases and an expectation that I would be back. The food section is, unfortunately, situated at the far end of Cornmarket Street, but it had the crowd last Saturday and there seemed to be more stalls than usual. Regulars at other markets, such as Natural Food Bakery and O'Driscoll’s Fish (who often sell out early), were in place and busy. Got some yeast bread and a terrific Date Slice from the bakery whose stock (it was about 12.30pm), was also diminishing. Lots of snack stalls, including Green Kiwi (coffee) and the Crepe Man. All active. Plant stalls too and no shortage of free range eggs. Oh yes and there is an apple stall here that doesn't appear at the other main markets (Douglas excepted). Mealagulla Orchards are from Ovens and they do a tasty juice, though €3.50 a bottle is a little dearer than their competitors. You could buy lots of vegetable plants there too, many in suitably small quantities, ideal for the suburban garden. 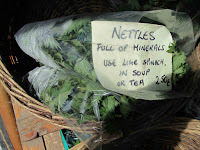 Recently, one of the local papers featured a nettle soup recipe by Darina Allen. 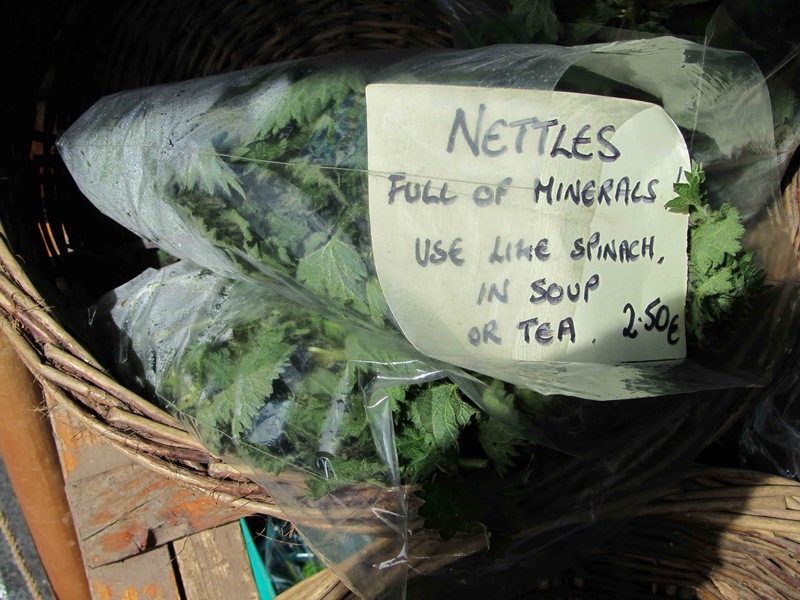 Well, you can get your nettles here at 2.50 a bag. And wild garlic (also 2.50) and a whole lot more, including rocket. Bought a little bag of Sprouting Broccoli (3.00). All these are available from Caroline’s Home-grown Vegetables. Get on down and have a “wander” along Cornmarket Street on a Saturday. 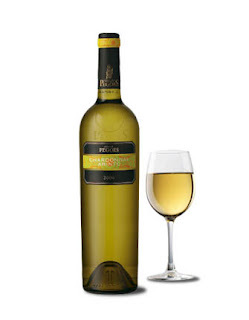 Adega de Pegoes, Chardonnay Arinto 2010, Portugal, 13%, €14.00-16.00 stockists. Colour is a light straw and the nose is aromatic, vibrant and fruity. On the palate, it is vivacious, dry with nicely rounded tropical fruit with a persistent dry finish. This well made blend, Adega de Pegoes, comes from the Setubal Peninsula and is a fifty partnership between the well accomplished international traveller Chardonnay and the versatile native grape Arinto. Unusually, for the Spanish/Portuguese area, it comes with a cork closure. A good wine at a good price. Highly recommended. · Many of you will be glad to hear that the Californian Wine Tasting is back in Cork again this year. The consumer event will be held on the evening of Monday April 30th, from 6 - 7.30pm, in conjunction with Easy Food Magazine. Dream football trip for all the family! Not exactly food and drink, though the Big Boys in Green enjoyed their cuppa here. Thought you'd like to know about this dream family trip. 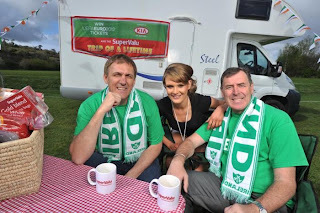 Miss Cork Susan Brosnan with Tony Cascarino and Pakie Bonner at the launch of the Supervalu Trip of a Lifetime to Euro 2012. More details (and pics) on my football blog here. “Have a nice wander” was the parting shot from a twitter buddy as I headed off to the Thursday Farmers Market in Mahon Point. “A wander” I questioned silently. But the word was fairly apt, even if the market stretches hardly a 100 yards and back again of course with a detour in the middle. But is does turn into a wander. No rush as you stroll and stop and shop, time galore to ask a question, talk about the weather, the new lambs, the new salad and so much more. and fantastic patter from Barry Tyner) and of course Mahon is not unique in that respect. True, but still these are generally friendly folk, always ready to talk. I met one lady stall holder for the first time Thursday, a really cold day, and she immediately confided that she had so many layers of cloths on that she was unable to bend! O’Driscoll’s from West Cork has to be the most popular stand here. Every time, there is a queue for their fantastic fresh fish; good service and a good price too. 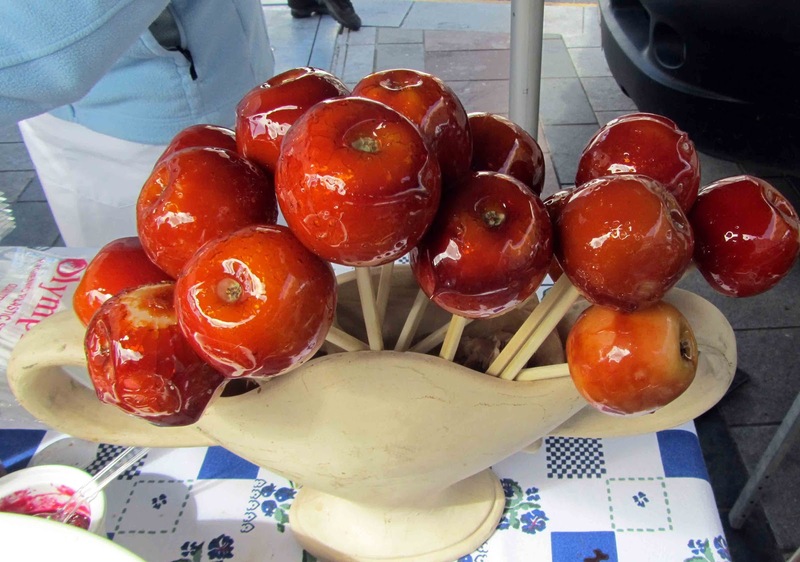 Must admit I have a few regular stops: Woodside Farm, Flynn’s Kitchen, Arbutus Breads, Gubbeen, Glenilen, and more. Go not just to talk but to buy as well. I start with a full wallet and empty bags; end with the reverse being true. And no regrets. 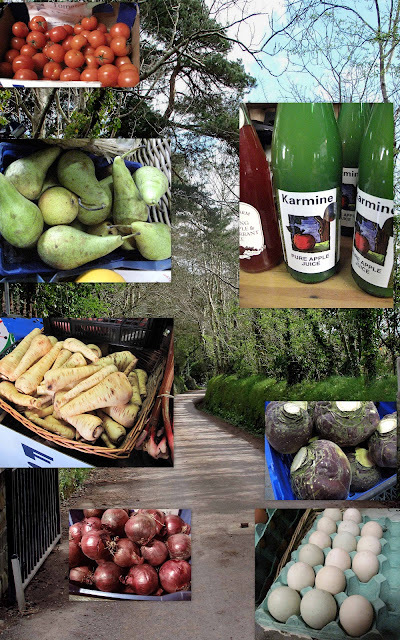 Great stuff there: apples and mushrooms from Ballyhoura, chickens and beef from East Cork, tasty sushi, two farmers from East Cork also with great selections of vegetables and also Organic Republic with a big selection of fruit and veg. 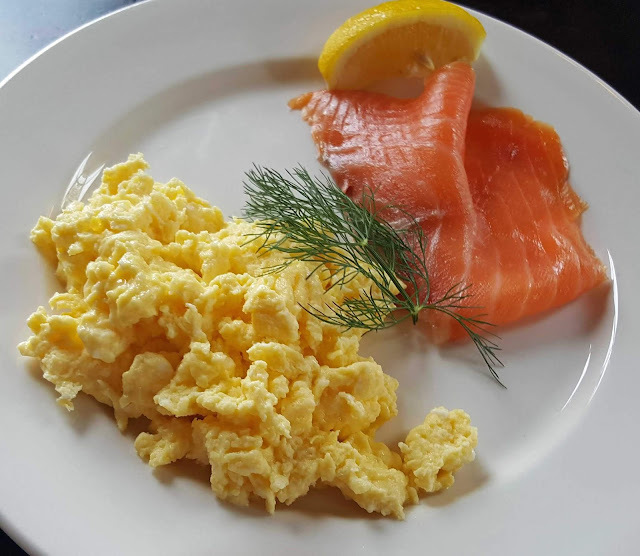 Coffee stops, the olive stand, fish also from Ballycotton, a cheese stall, jams and relishes from Una Poynton and an award winning range of pies from Una’s Pies, not to mention Buttevant’s Old Millbank for smoked salmon and other goodies. And something nice to finish with? No bother. 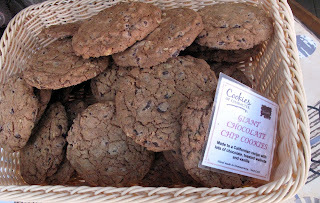 Why not call to Midleton’s Bite-Size (love their carrot cake), Cookies with Character, or the Natural Food Bakery (they also do a smashing carrot cake as well as my favourite white yeast loaf). I know I have left some out. You may see the full list here. And don’t forget, if you don’t; make it to Mahon, that many of these will be selling their fares at Midleton and Douglas on Saturdays. So give that wallet an airing and bring a few large bags. 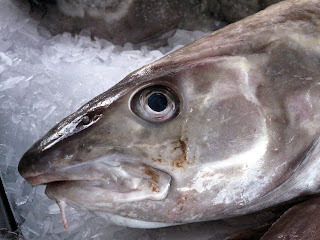 Sometimes I head off to the market, without a clue and end up buying willy nilly. Later, have some sorting out to do. Eat this at lunch, this at dinner. Or are you all organised? Head off with a list? Either way, you can have fun but perhaps we do need some idea as to what to buy. And, to be honest, I usually do, even if a rather vague one!. 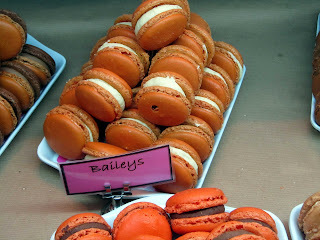 The market, whether the various farmers markets or the English Market, are great places to fill a menu. Just like this unplanned one that we did this week. 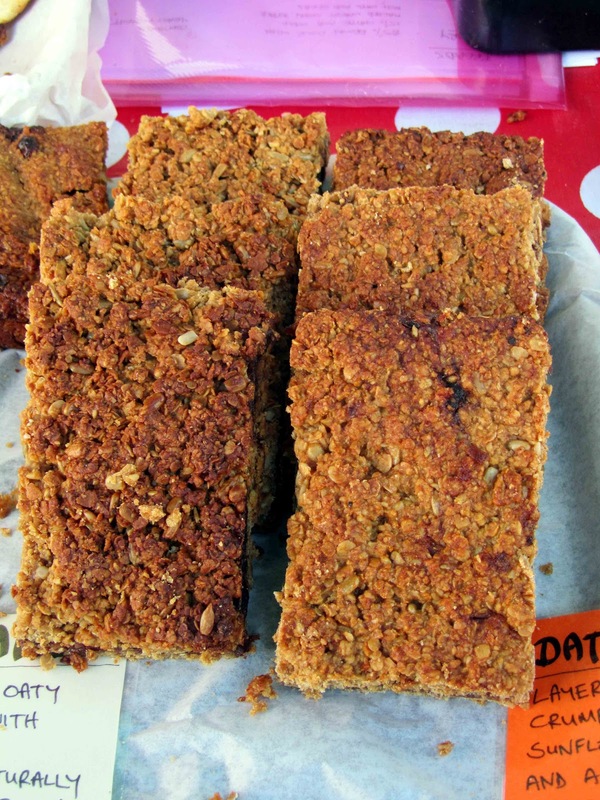 Dessert: Date Cake (Natural Food Bakery). Let us fill that in a bit. Barry (left) does a great Cognac and Garlic Paté but this time we went for the creamy Chicken with Caramelised Onion one. Served it up with toasted White Yeast Loaf (Natural Food Bakery) and a salad. That salad featured lettuce from Organic Republic. Quite a bit of greenfly on it – suppose that proved it was organic! Shook it up and washed it off and looked okay. In any event, I’d prefer to eat a few tiny aphids than some unseen pesticide! 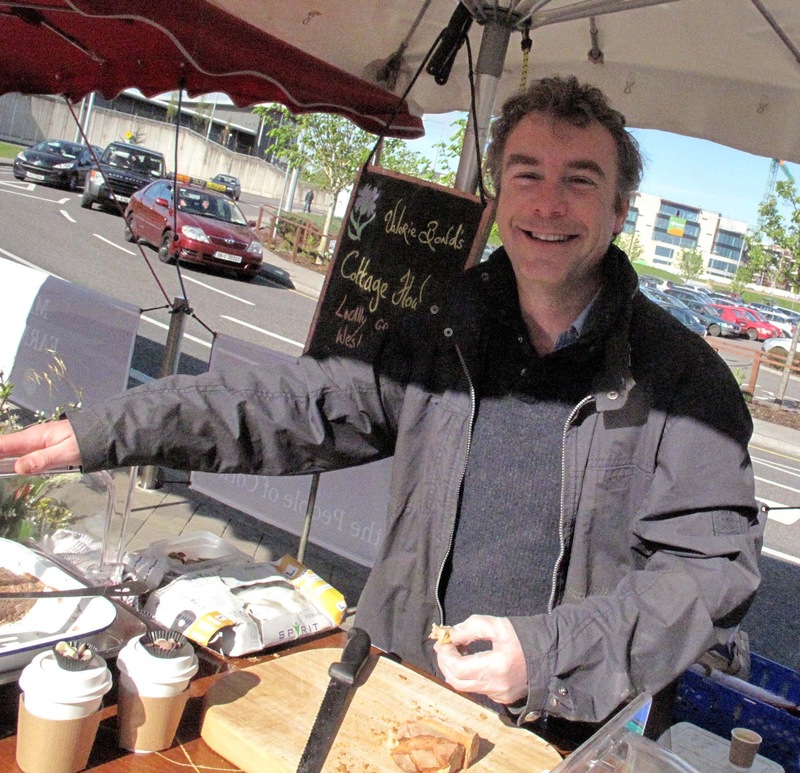 Martin of Woodside Farm has quite a presence at Farmers Markets; you’ll find him (or wife Noreen) at Mahon, Cobh, Midleton and Douglas. His free range pork steaks, tender and super tasty, are just the job. We did a Paprika Pork recipe (top picture), a simple pan fry, enriched with caramelised onions and crème fraiche (pictured). It was served with rice and green vegetables. The greens, beans and broccoli, came from the organic section in a nearby Dunne’s Stores. Supermarkets have their uses too! 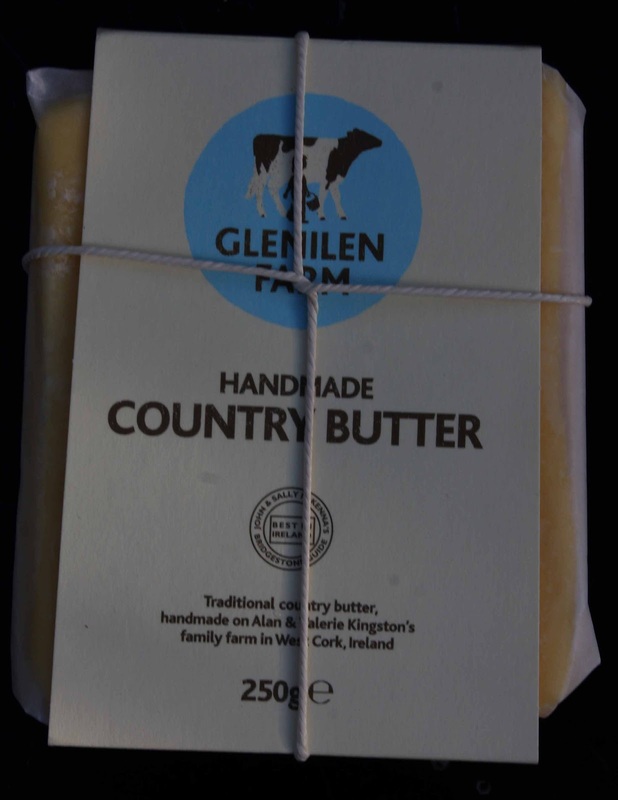 Gubbeen are regulars in Mahon and the cheese was their gorgeous smoked mature. 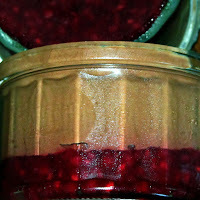 Two relishes were used (same as with the paté), a Baxter’s Redcurrant Jelly and a Mango Chutney from Aldi. The Natural Food Bakery have a stall in Mahon and also include the Coal Quay in their itinerary. Besides, they have a shop/cafe at the Daunt’s Square end of Paul Street. I bought the Date Slice* in the Coal Quay and that, plus a cup of Badger and Dodo coffee, provided a fitting end to this Market Meal! Have you put a Market Meal together? I’m sure you have. Let us know! 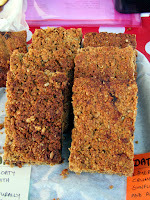 * The date slice consisted of layers of oaty crumble with sunflower seeds and a hint of ginger and sweet stewed dates. Wheat free, sugar free and dairy free. 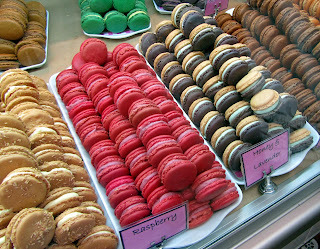 Have been resisting that relatively new Macaroon stand in the English Market for a while. But no longer. Just succumbed. What flavours. A brilliant sensation in the mouth, “a light mix between crunch and smooth” as they say themselves. 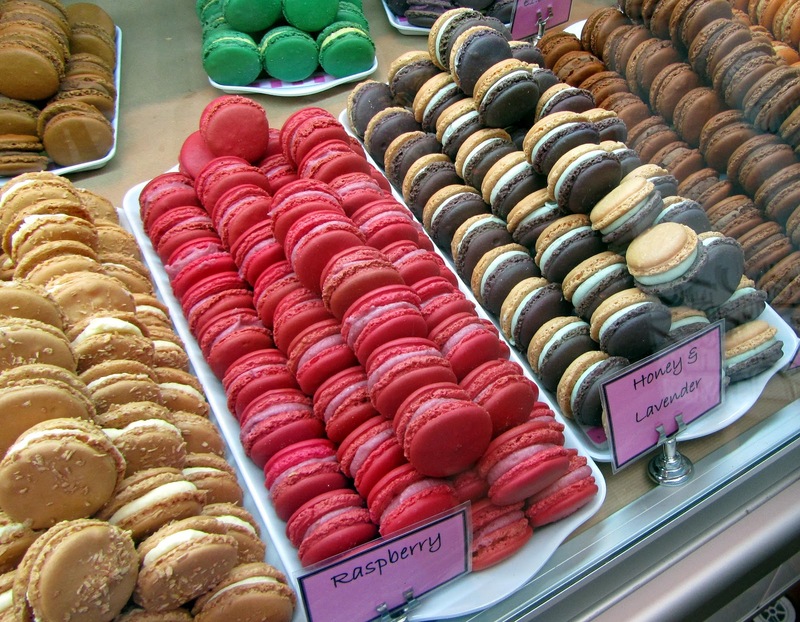 My favourite was the Lavender and Honey but there are so many to try. Just a couple of items on the local Slow Food agenda. 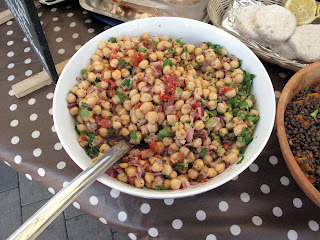 If you want to know more, why not check out the website http://www.slowfoodireland.com/. Where you may also subscribe to the regular newsletter. Tuesday 17 April at 7pm - Cork City Convivium will have a blind tasting at Fenn's Quay - eat your meal whilst blindfolded and guess what you're eating - a true sensory meal. COST: Slow Food members €25 per head, non members €30. Tuesday 24 April at 7pm - East Cork Convivium with OOOBY - Out of Your Own BackYard - Mike and Suzie Cahn will talk on this local food initiative which supports local fresh organic produce, local food suppliers and offers educational and community initiatives at Ballymaloe Cookery School. All proceeds to the East Cork Slow Food Educational Project. On the home front, I have been concentrating on the Rhone area, more or less. Some fantastic wines in this region. You’ll be familiar no doubt with Gigondas and Vacqueyras but do you know the wines of Mas de la Dame? From organically grown vines, the two ladies here make a brilliant blend of Syrah and Cabernet Sauvignon. I thoroughly enjoyed their 2006 La Stele Rouge (Les Baux de Provence). The Vacqueyras was a top notch Cuvee des Saint Papes 2008 while the excellent 2007 Gigondas, Cuvee Vieilles Vignes, was produced by Domaine du Grand Montmirail. Both of these were bought in the villages of the same name but I’m pretty sure you can find something similar here. 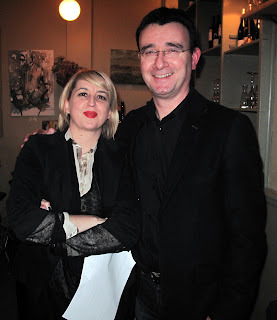 The Wine Store http://www.thewinestore.ie who specialise in Rhone wines, would be a good bet. I’ve been using some of those better than half price deal vouchers and the most recent was this week when I called to one of my local hotels, the Hotel Montenotte. The Groupon voucher promised a couple of cocktails and a main course each for €25.00. Hadn’t been to the Montenotte for quite a while but it turned out to be quite an enjoyable experience. The voucher mentioned the Vista Bar and Grill but we were directed to the adjoining restaurant section; both enjoy the same views over the city. The hotel and dining room looked brilliant. Service was low key, courteous and efficient. The cocktails didn’t materialise. Instead we were served with a glass each of a rosé Prosecco, quite dry and tasty. No quibbles there; only bubbles. There were supplements on the various steaks but again this had been flagged to some extent by Groupon. We checked out the well worn menus as we sipped the bubbly. 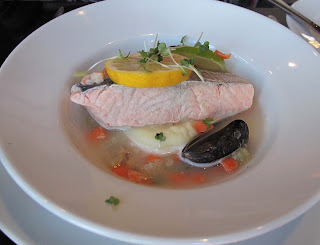 CL decided to go for the Poached Darne of Atlantic Salmon (C), priced at €16.75. This turned out to be quite a pleasant surprise. It was served, unusually, on baby potatoes with a fresh mussel and winter vegetable broth, with a side dish of spot-on vegetables. A little different and a very pleasing main course indeed. Didn’t expect any problems with my sirloin and none materialised. It was done just as requested and I really enjoyed the creamy mushroom sauce and my little bucket of French fries (nice touch!). Had a look at the desserts but, after two sizeable platefuls (and the fact the Champions League was about to start on telly! ), decided to finish off with coffee. Again, this was well up to standard, Bewley's I believe. 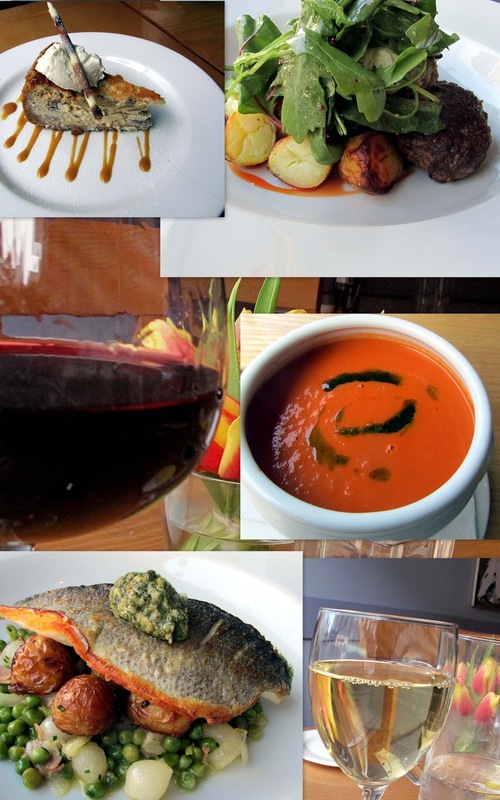 There are some other items on the menu worth exploring and you can see the lot here. If you'd like to see more local deals from Groupon click here. What to Eat. This book might change me! You?